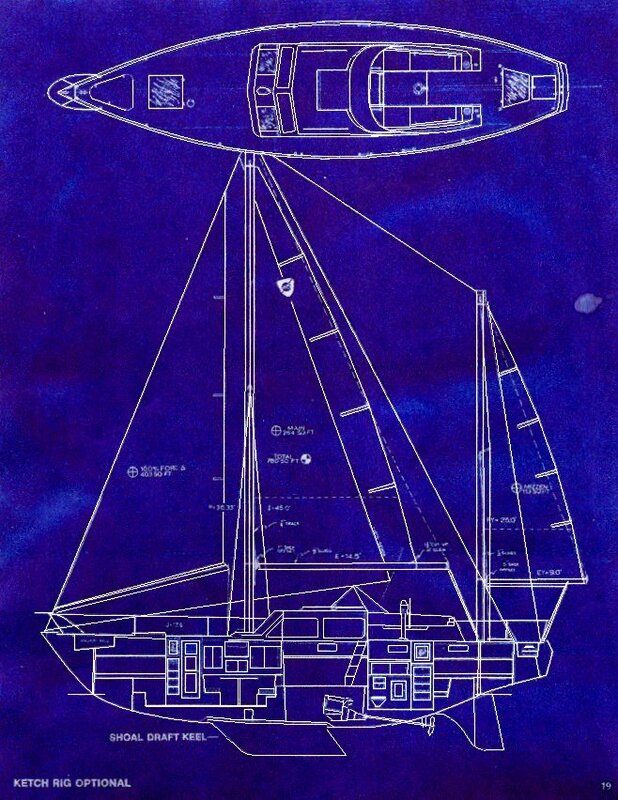 sethpool – Page 2 – Which Sailboat? More specifically, this is some news from the VIP day on Thursday, October 8, 2015. Catalina Yachts says they are re-introducing a three stateroom option on their upcoming 425. Catalina has not offered a three stateroom boat since the Catalina 42, although in the interim some buyers of new Catalina yachts have converted the “flex space” beneath the port cockpit seat into a third stateroom. Neel Trimarans brought a new 45 Custom Line, which had a new “owner’s layout”. In this version, the starboard stateroom is converted into a very large head. The port stateroom is larger because it does not have an ensuite head as in the original layout. The French production builders drew much attention with their slew of new models and, as usual, excellent location at a central dock junction. 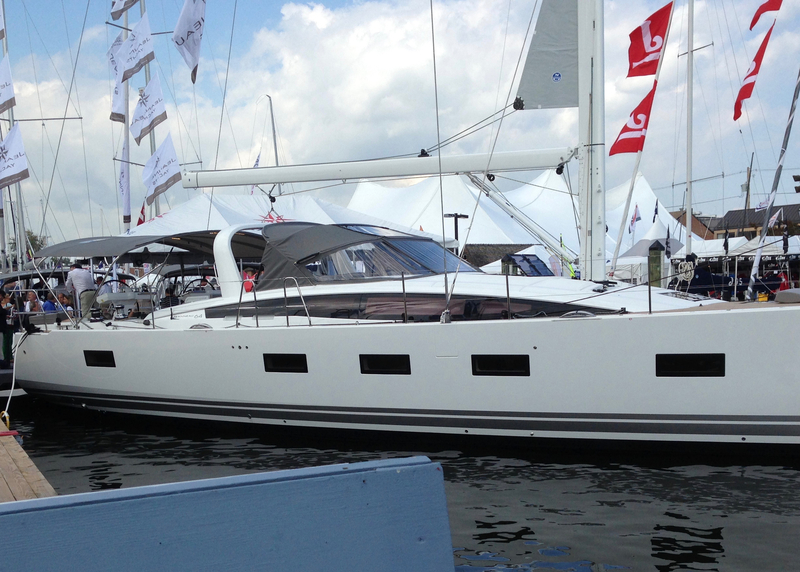 This year, Jeanneau refreshed nearly their entire line of Sun Odyssey boats. Jeanneau displayed the new Sun Odysseys 389 and 519, Jeanneau Yachts new 54, new 64, and existing 57, which had some interior updates. 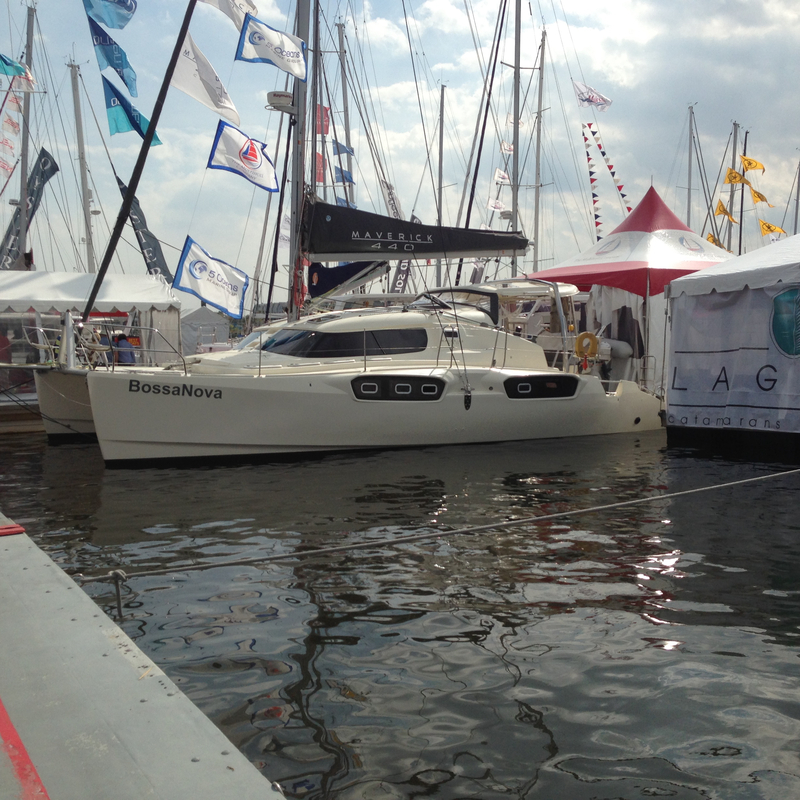 Jeanneau also brought their existing Sun Odysseys 349, 439, and 44DS. Jeanneau’s new boats are an evolution of the line being very similar to the boats each one replaces. Jeanneau more or less added a foot to each of the existing boats, made the hull chine more distinct, and removed retractable keels as an option on the smaller boats. However, the 519 has a centerline backstay, which is new compared to the split backstay like on Jeanneau’s other boats. The Jeanneau 64 on display had a fiberglass cockpit arch. Although this caused me to avoid the 64, I did learn that the arch is thankfully only an option. While the 64’s topside port lights look garish in Jeanneau’s stock media photos, they look okay in person. Lagoon brought their existing 620, which was available for viewing by appointment. Appointments were not exclusive. The boat is every bit as enormous as it appears in Lagoon’s stock media. Lounging spaces are everywhere. Ascending and descending the spiral companionway was not bad as anticipated. 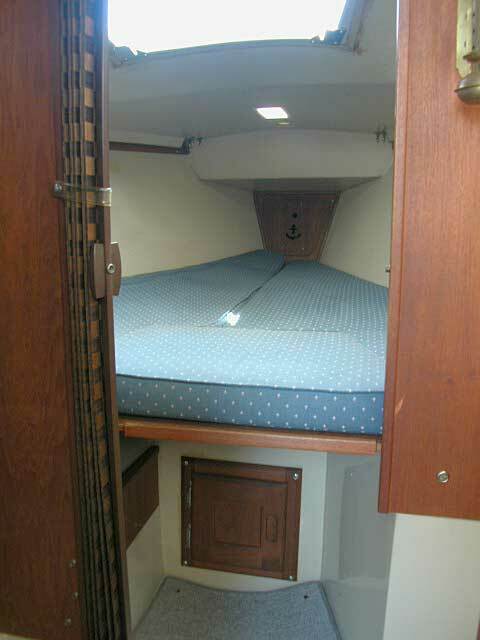 The companionway space is tight with surrounding handholds on both sides. Maverick Yachts introduced their new Maverick 440 catamaran, which looks like something from a James Bond movie. The overall impression is an attractive modern look. Fusion Catamarans had one of their kit boats on display. Garcia brought their semi-custom 45i. Not only is its aluminum hull impressive, but systems design is excellent, as well as fit and finish. Southerly was notably absent. They usually sail one of their customer’s boats from the other side of the pond. The folks they have on board are always very knowledgeable and friendly. 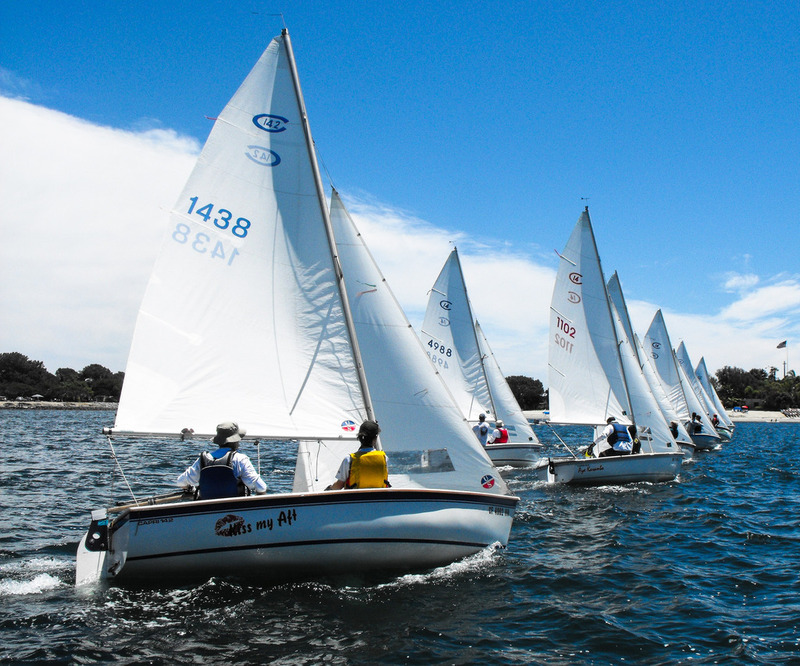 Their boats are also unique in many ways, especially in that all models are blue water capable and have retractable swing keels. I hope that Southerly was not present because they couldn’t line up a customer’s boat for the event, were concerned about the weather during the crossing, had no new models to show off, or suspected that the French production builders would dominate attention with their slew of new models out this year (more on that in a moment). I hope that Southerly is not withdrawing from the North American market due to limited demand. 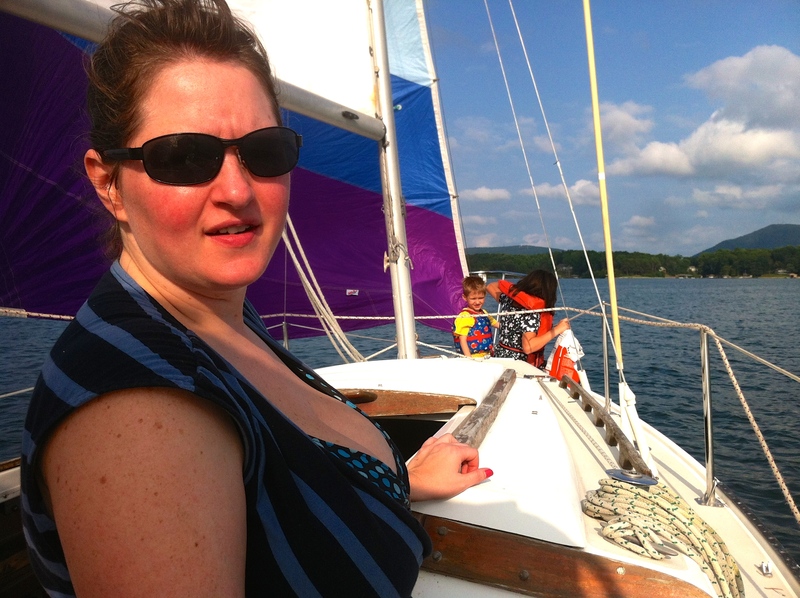 Check back later for extensive photo galleries of the Jeanneau boats. 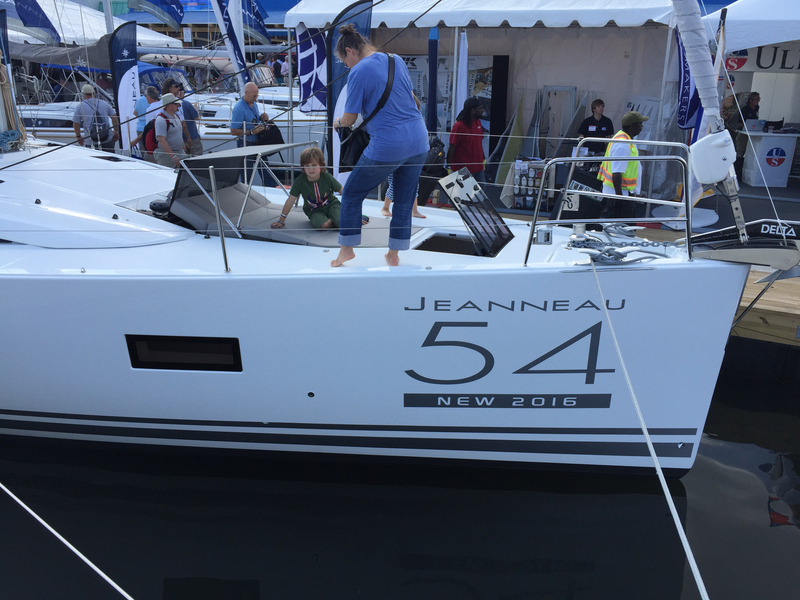 See the Jeanneau 57 photos here. 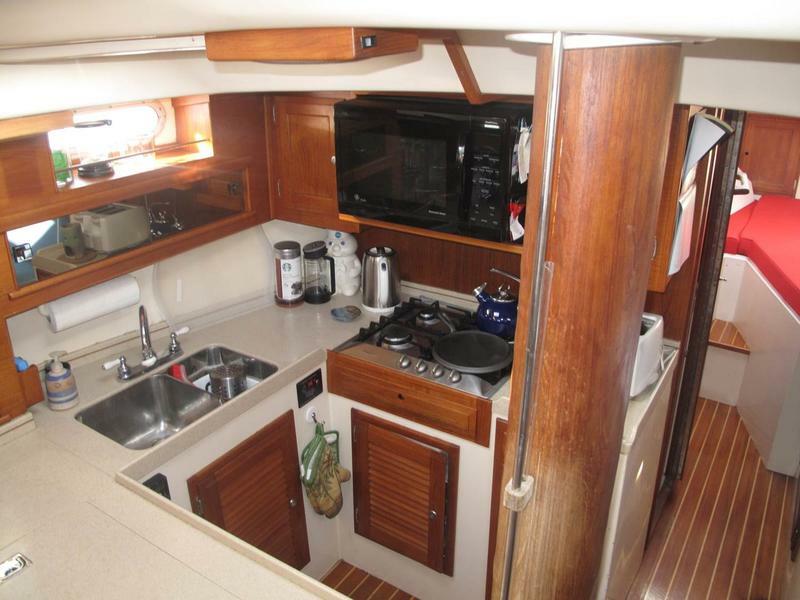 See the Jeanneau Sun Odyssey 44DS photos here. 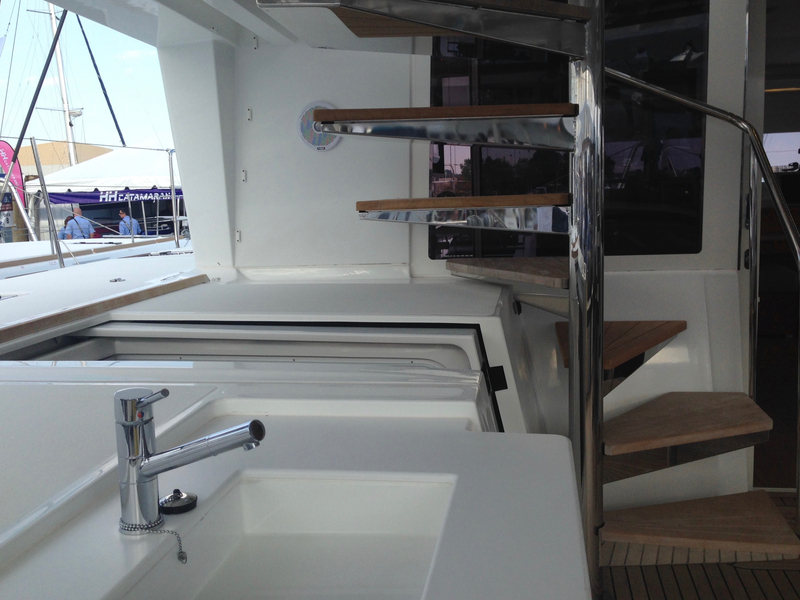 See the Jeanneau Sun Odyssey 349 photos here. 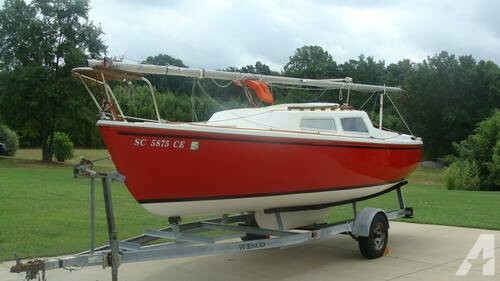 The Catalina 22 is the most commercially successful sailboat of all time and is one of the 5 inaugural members of the American Sailboat Hall of Fame. Frank Butler of Catalina Yachts designed the Catalina 22, which was Catalina’s first production boat. Since 1969, Catalina Yachts has built and sold over 16,000 Catalina 22s. Catalina continues to manufacture this boat to meet continued sprightly demand. 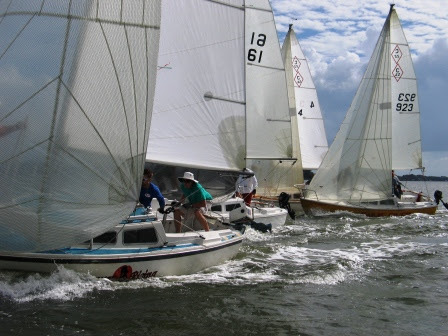 Continued market demand and production of a family cruiser and racer of this size contrasts with the next two models up in Catalina’s line, the Catalina 25 and the Catalina 27, which are no longer produced. 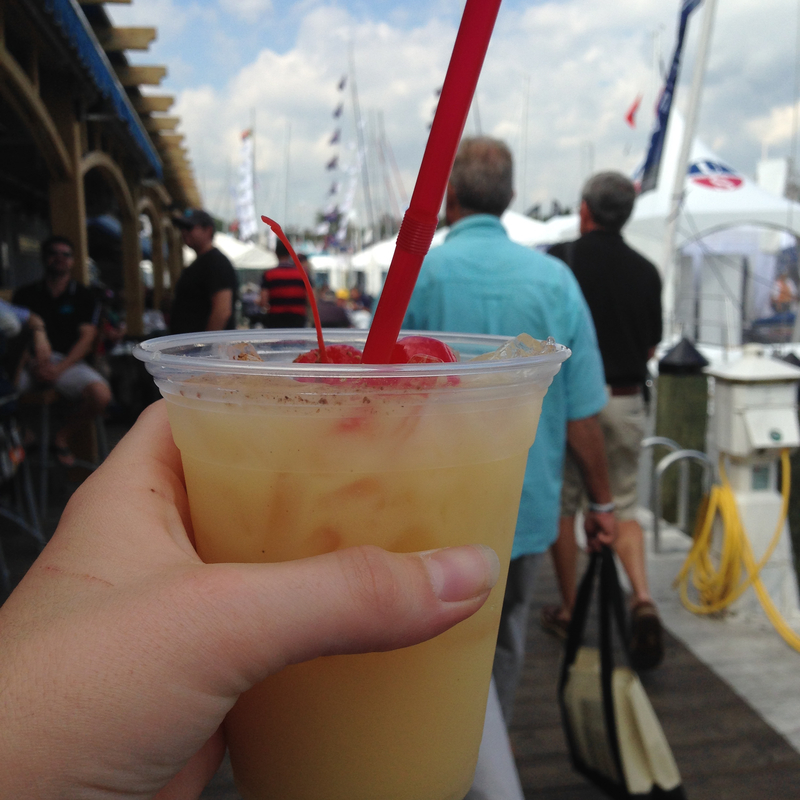 The Catalina 22 is an excellent day sailer, racer, and weekender. 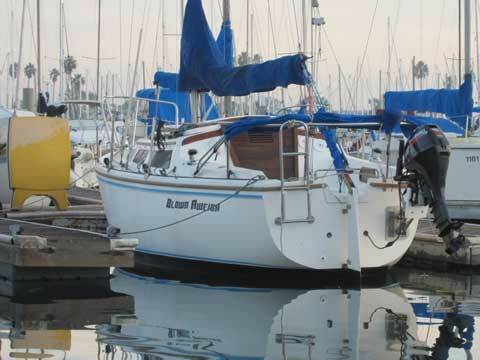 She has classic Catalina lines and port light configuration that many sailors find timeless. Although Catalina has updated the Catalina 22 throughout its production run, early boats remain modern-looking and attractive by today’s standards. Many sailors will prefer the lines of the earlier boats over the lines of the most recent. With its light displacement and available swing keel, the Catalina 22 can truly be considered a trailer-sailer by any modern standard. Unlike many builders of sailboats available on the used boat market today, Catalina remains in business, and continues to manufacture and source parts for the Catalina 22. Catalina 22 owners benefit from Catalina Direct, which makes buying many Catalina 22 specific parts very convenient. As an aside, it’s worth noting that Catalina Direct is a dealer for Catalina Yachts and is not run by Catalina, the manufacturer. With the vast majority of Catalina 22s still afloat, the boat has a huge user base and a very active owners’ association with racing, the Catalina 22 National Association. Many owners of the Catalina 22 report that the plethora of information available from other owners, that the manufacturer was still in business, that a version of the boat continues to be manufactured, and that spare parts were readily available, were key points influencing their decision to purchase a Catalina 22. Catalina produced the original Catalina 22, called the Mark I, until 1995. 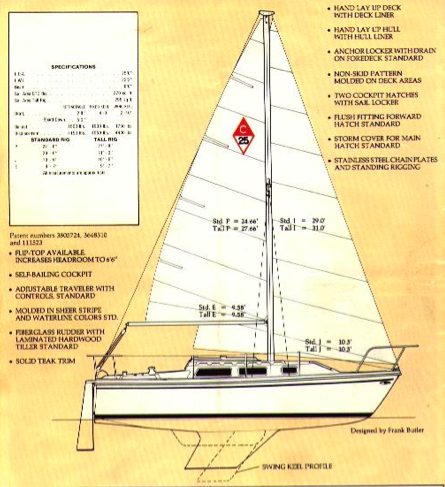 In 1973, a fin keel was offered in addition to the swing keel. In 1976, a stronger heavier mast was introduced. In 1986, Catalina introduced the “New Design”, which saw revisions to the rigging but not to the sail dimensions, aluminum trimmed port lights replaced with smoked plexiglass, interior layout changes, addition of a separate fuel locker and battery compartment, moving the forward hatch aft of the foredeck to the cabin house, and addition of an anchor locker. 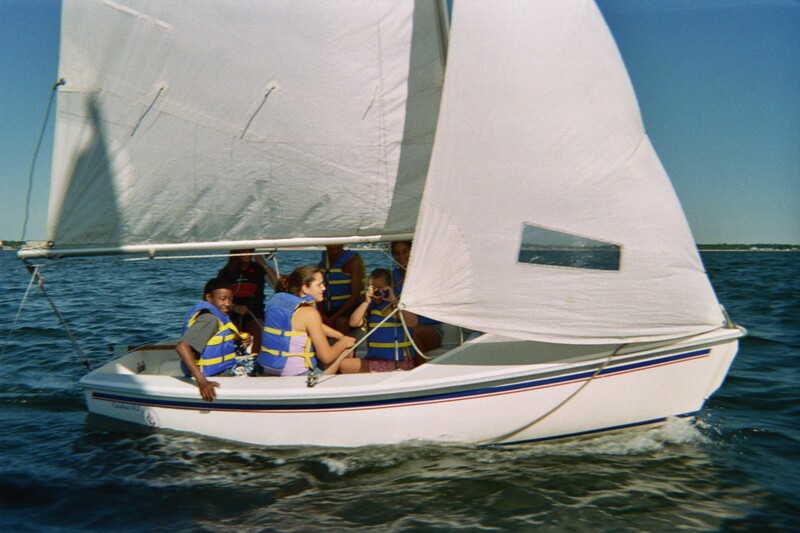 In 1988, a wing keel option was offered in addition to the swing and fin keels. In 1995, Catalina introduced the Catalina 22 Mark II, which included revisions to the hull above the waterline, cabin house and port lights, interior layout, pop-top, and offered additional interior options. In 2004, Catalina introduced the Catalina 22 Sport. 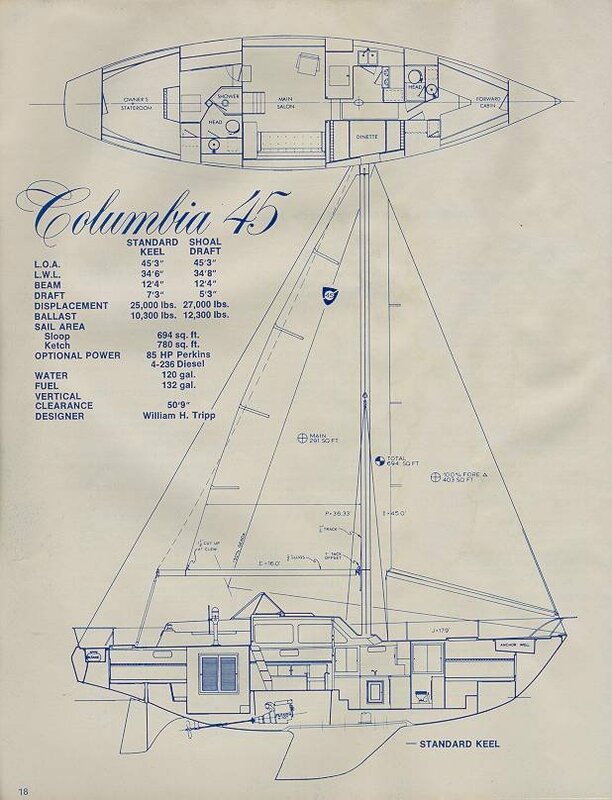 For the Catalina 22 Sport, Catalina redesigned nearly the entire boat except for the hull, keel, rudder, and sail plan, which were left the same so that these boats could compete in one-design racing. 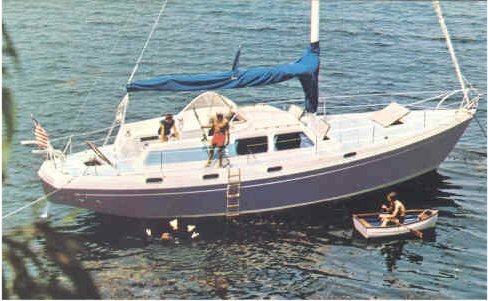 Catalina introduced an additional 22 footer, the Catalina Capri 22, in 1984. This boat has a different underbody from all of the above Catalina 22 boats and is not eligible for Catalina 22 one-design racing. 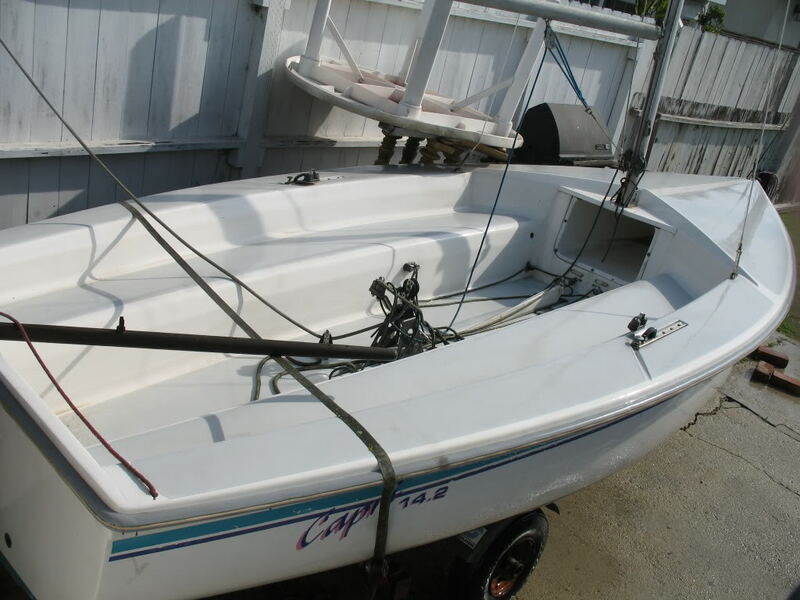 Catalina continues to manufacture this boat, today called the Catalina 22 Capri. The build quality of the Catalina 22 is good for its intended purpose as a daysailer and weekender for inland and protected waters. The hull is solid hand-laid fiberglass. Some Mark I models had plywood stringers, which can rot. The deck is fiberglass sandwich with a plywood core. The hull-to-deck joint is Catalina’s preferred shoebox design, but only fastened with screws and chemical adhesive which are sufficient for the boat’s intended cruising grounds. 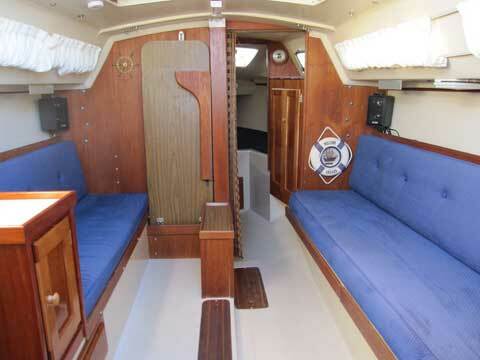 Interior fit and finish is excellent for this size and class of production boat. The interior is a molded fiberglass liner. Interior woodwork is an attractive and durable marine ply with teak veneer with some solid teak pieces for structural loading. All standing rigging is stainless steel. Catalina 22s built before 1977 had a lighter, weaker mast, and lighter gauge standing rigging. These early boats were not designed to carry a headsail greater than a 110%. A few of these earlier boats suffered mast failures when carrying a larger genoa. 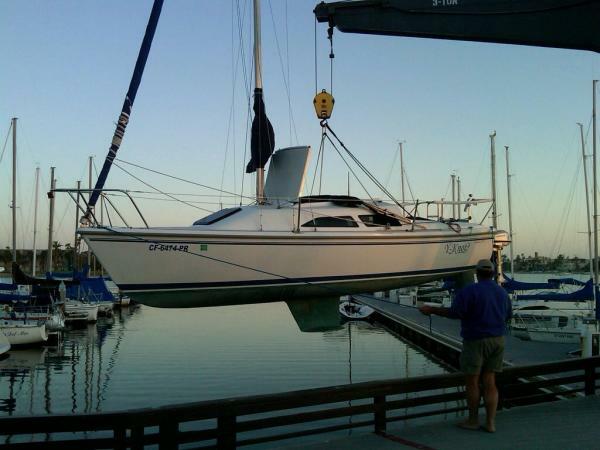 In 1978, Catalina fixed this issue on all new Catalina 22s by installing a stronger, heavier mast and heavier gauge rigging that could support the greater loads associated with larger headsails. Minor blistering was an issue on some earlier Catalina 22s, which was a common issue for boats manufactured during that period. Hull blistering issues are hit and miss, with some Catalina 22 owners reporting never having any. Due to the long production run and improvement of fiberglass technology during this time, blistering issues were reduced in each successive year, and were nearly non-existent by the mid-1980s. As with all early Catalina boats that had aluminum trimmed port lights, leaking is a common problem. Catalina Direct offers a Catalina 22 specific kit to reseal these port lights. 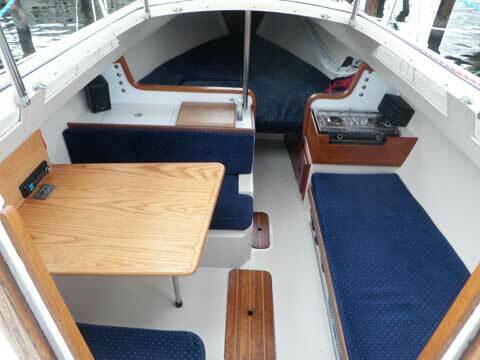 On Mark I boats, the electrical panel was installed on the side of the aft dinette seat where it can be damaged by kicking when moving about the cabin and by water intrusion between the hatch boards. Some owners install kick plates over the electrical panel to protect the switches. Due to the relatively simple electrical systems on the boat, moving the electrical panel to a better location is only a small project. For the New Design, Catalina moved the panel to the shelf in the port side of the hull. Catalina moved the panel again for the Mark II model, placing it beneath the companionway steps, which returned it to the same location issues as the Mark I boats have. Early Catalina 22s came from the factory with through-hull plumbing fittings secured only by single hose clamps, instead of two. This is of course easy to fix if not done already. Early boats also had gate valves installed for through-hulls, which was common at that time. Gate valves should be replaced with proper seacocks. 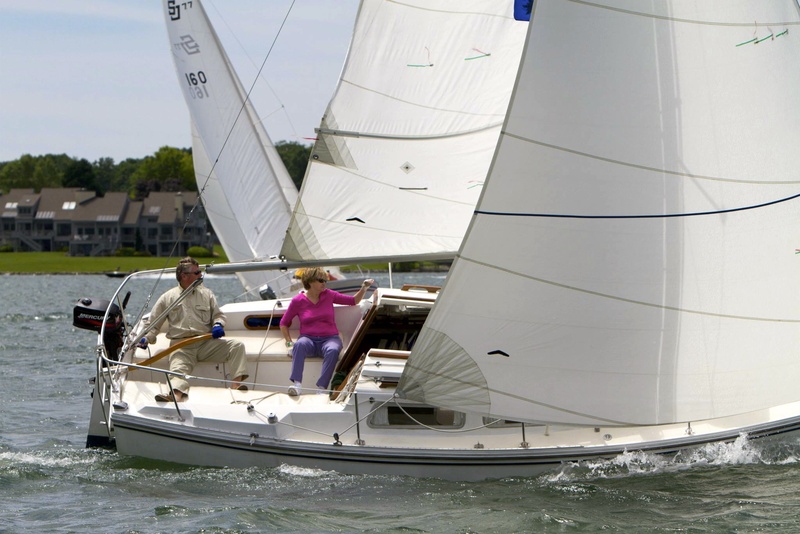 The Catalina 22 is a masthead sloop with a sail-area-to-displacement ratio of around 18 (depending on keel), which puts her traditionally in a medium-cruiser class. The mast is deck stepped with a compression post below decks to support the mast. The mast is supported by one set of spreaders and one set of upper shrouds, and two sets of lower shrouds. Some Catalina 22s came equipped from the factory with boom vangs, while others did not. 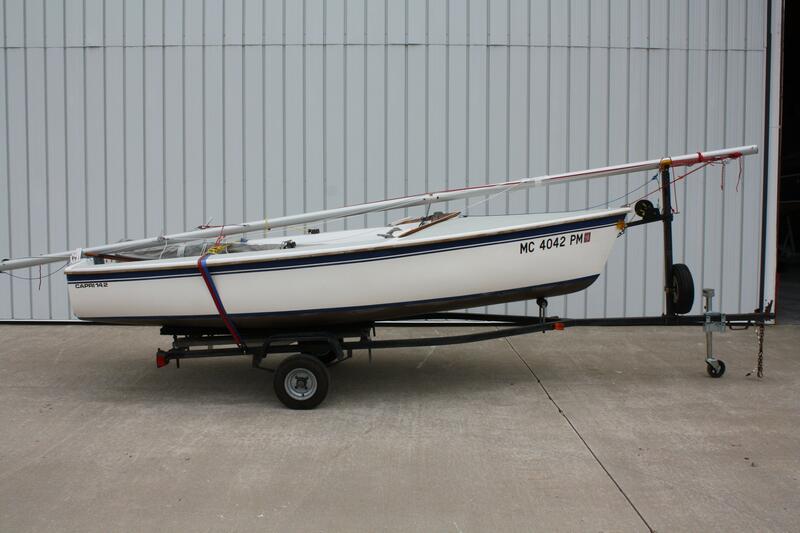 Catalina 22 specific boom vang kits are available from Catalina Direct. 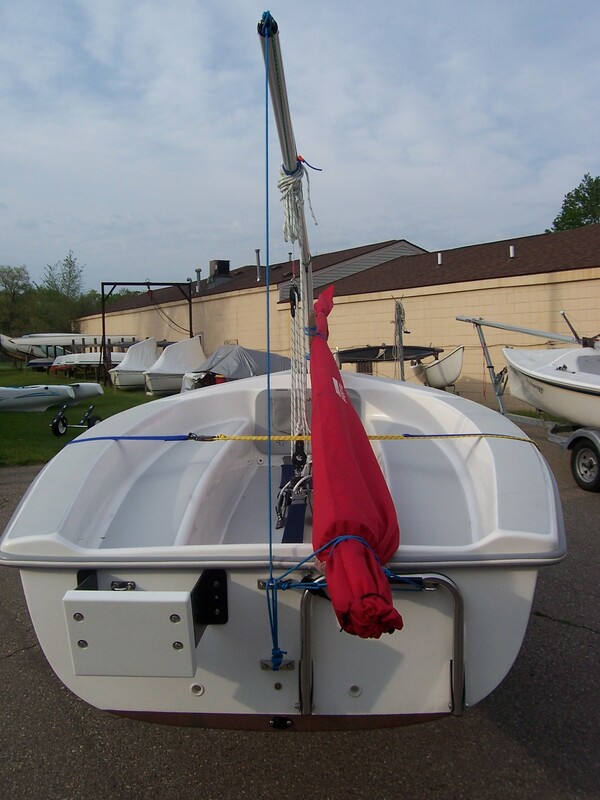 All boats came with an adjustable mainsheet traveler. The jib car tracks are very short, but this is not likely an issue for the vast majority of sailors who will rarely adjust the location of their jib cars anyway. A small winch and clutch is installed on each cockpit coaming to manage jib sheets. No halyard winches were installed from the factory, but clutches were typically installed at the aft end of the cabin house so as to be accessible from the cockpit. Catalina has deliberately never changed the dimensions of the rig during the entire production run so that any Catalina 22 regardless of year can compete in Catalina 22 one-design racing. The vast majority of Catalina 22s were delivered with a swing keel. Over the production run, Catalina introduced two additional keel options, a fixed fin and a fixed wing. The fin keel has a draft of 3′ 6″ and provides 765 lbs. of ballast. 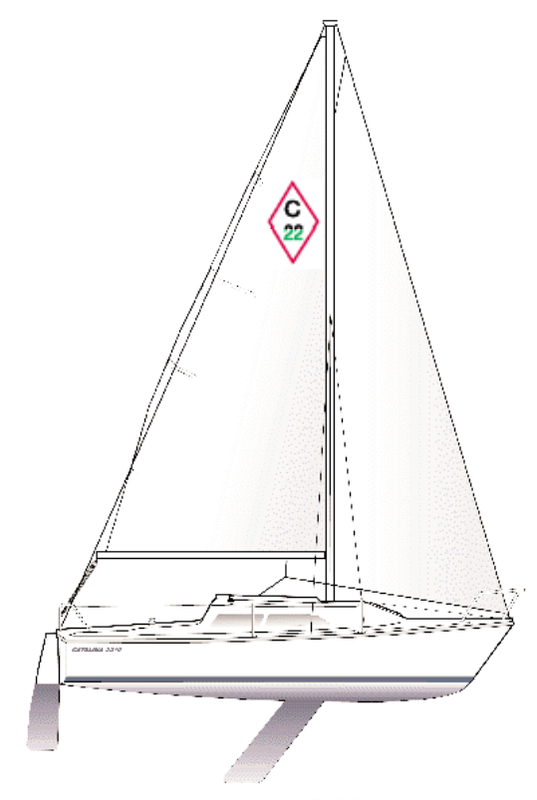 The wing keel has a draft of 2′ 6″ and provides 708 lbs. of ballast. The Catalina 22 swing keel warrants its own discussion. On earlier boats, the swing keel was cast iron and in later boats, cast lead. Beginning with the Mark II model, all swing keels were encapsulated in fiberglass. The swing keel weighs 452 lbs. and serves as all of the ballast for the boat. 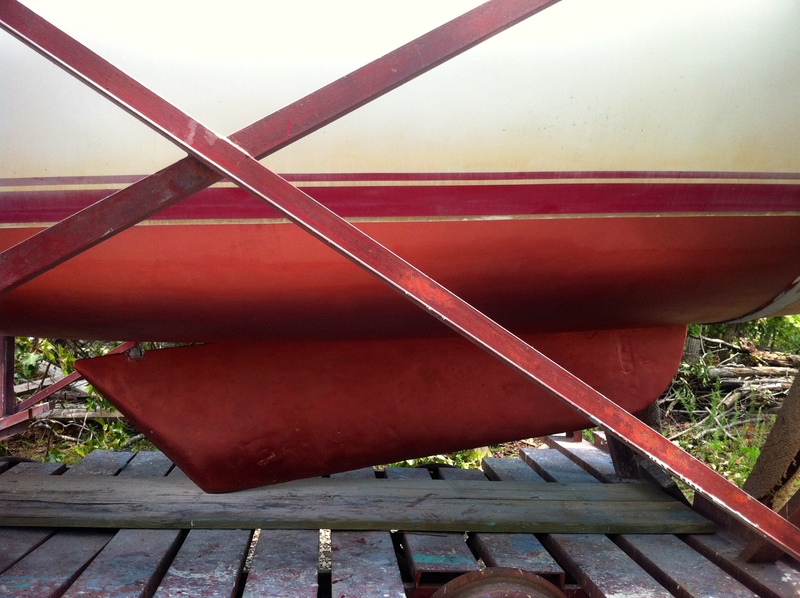 The heavy weight of this swing keel prevents many of the annoying banging noises associated with unballasted swing keels. The keel can be raised by way of a simple and reliable manual winch system located below the companionway steps. Little effort is required to operate the winch. The swing keel pivots from a down position to an aft-and-up position on a 1” diameter cast bronze rod hung between stout cast bronze hangers mounted to the underside of the hull. When down, the keel provides a 5′ draft, which is very deep for a boat of this size. When the keel is fully raised to its horizontal position, the Catalina 22 has a draft of only 2′, which is of course handy for gunkholing or if the water gets shallow when exploring. 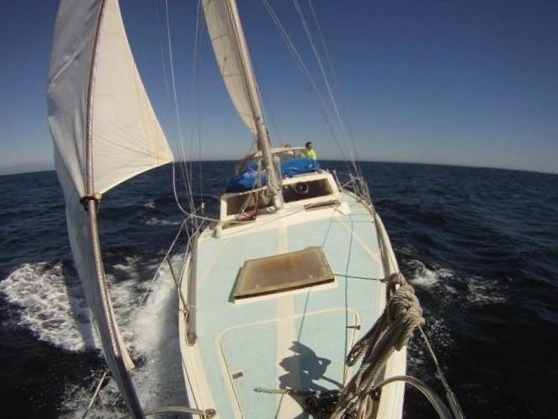 In the event of a grounding, the keel gently swings back and away rather than getting damaged or causing damage to the hull as can happen with fixed keels and vertically lifting (not swing) keels. When the swing keel on the Catalina 22 is fully lowered, the keel orientation is high aspect and has a symmetrical foil shape, similar to modern race boats, so that the boat points to weather extremely well and tacks on a dime. When completely raised, only a small part of the keel is enveloped in the hull, with the rest protruding. 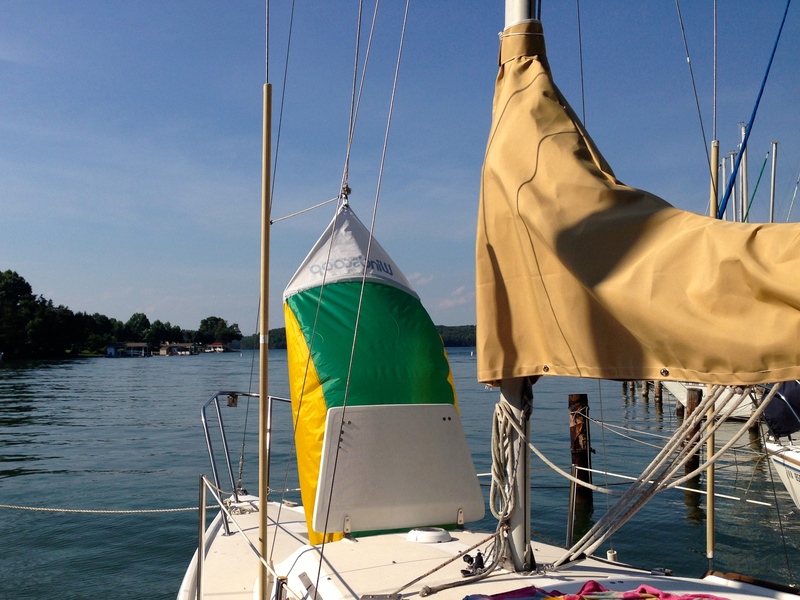 Therefore when the keel is fully raised, the keel orientation is very low aspect, making for nearly a full keel configuration, enabling the boat to track well with little helm attention, even when sailing downwind. Catalina recommends that Catalina 22 swing keel hardware be inspected every two years if in a salt water environment, and allows for longer if in fresh water. However, some owners in fresh water environments report never inspecting their swing keels after thirty years of use and have no problems. Catalina also recommended a retrofit be performed on earlier Catalina 22s to reduce the side-to-side movement of the keel along the pivot pin, which could cause the keel to wear through the pin. If not already done, owners should perform or have this retrofit performed. A retrofit kit is available from Catalina Direct. Despite the early swing keels being cast iron, Catalina did not typically install a sacrificial anode on Catalina 22s at the factory. 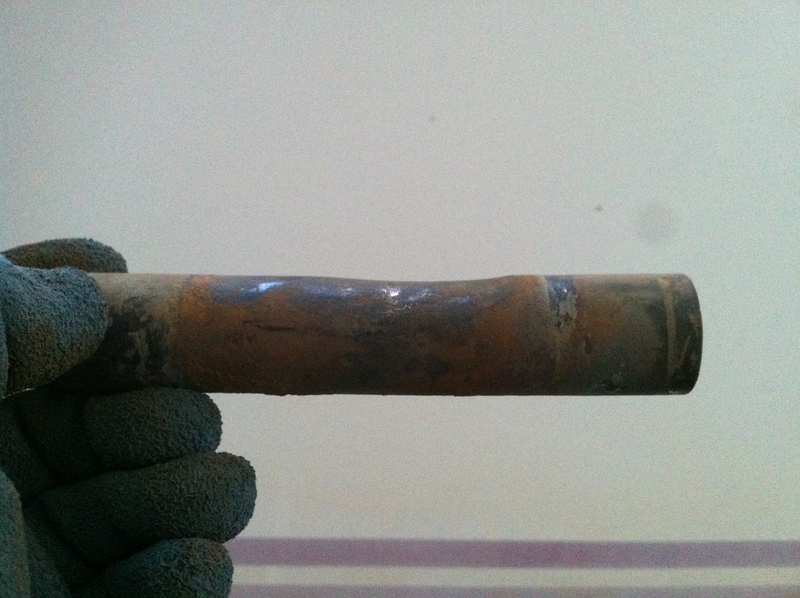 Catalina 22s should have a sacrificial anode installed, especially if in salt water, although owners of fresh water boats without sacrificial anodes have reported little corrosion. Sacrificial anode kits, including the drill bit necessary to go through the cast iron, are available from Catalina Direct. 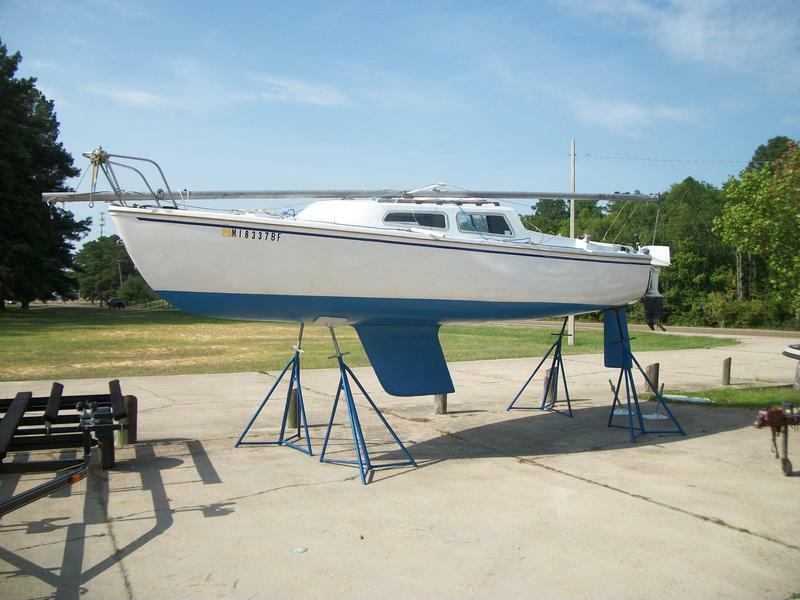 Catalina 22s produced from 1995 onward had the cast iron keel encapsulated in fiberglass, which further reduced potential corrosion issues. The Catalina 22 has a transom hung rudder commanded by a tiller. 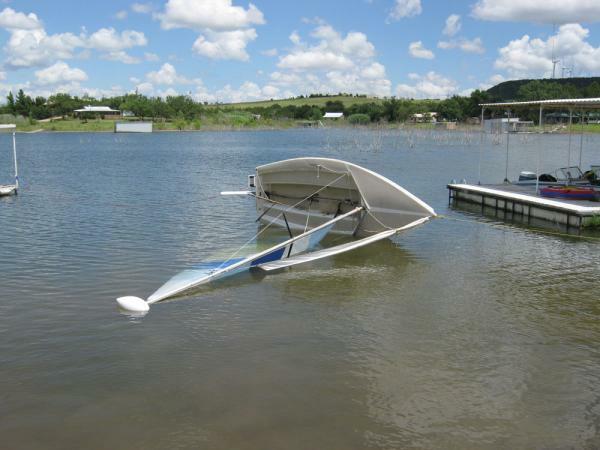 Mark I boats came with a kick-up rudder that may avoid damage if grounded, and can also be secured up when in shallow waters using the factory-installed rudder rigging. New Design and later, boats were delivered with a solid rudder instead of the kick-up model. 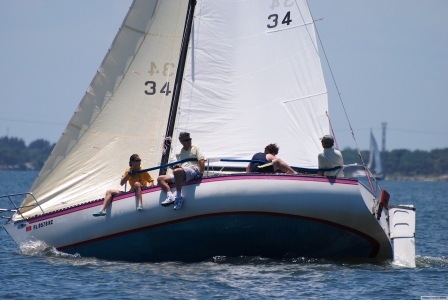 The solid rudder can provide better sailing performance but can be damaged when the keel is raised in shallow waters because the rudder extends beyond the depth of the raised keel. 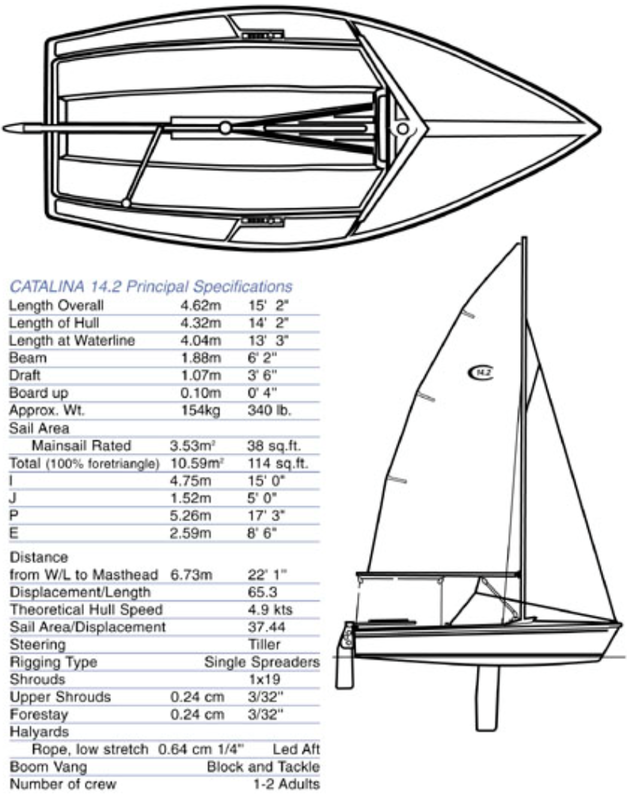 The Catalina 22 has a very flat canoe body and beam carried well aft resulting in excellent initial stability, and low wetted-surface area contributing to speed. 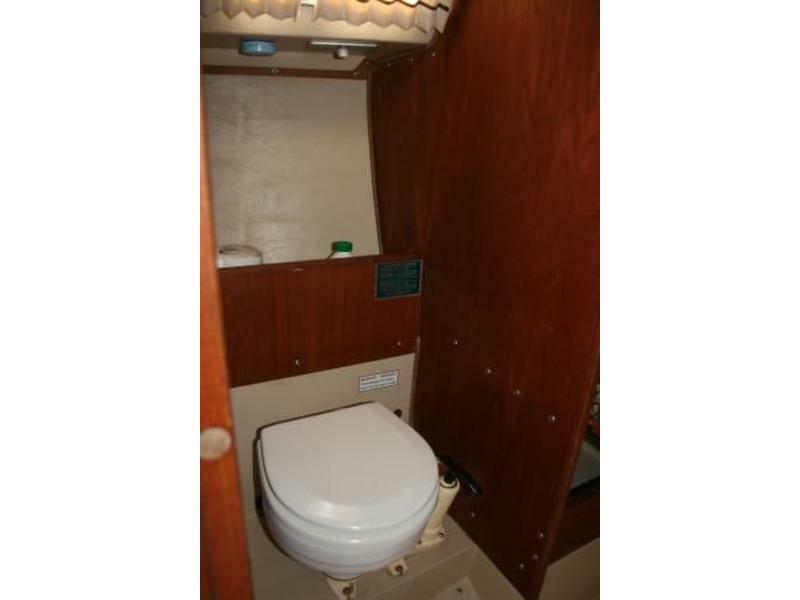 The boat has a relatively deep forefoot, which prevents the flat body aft from pounding. Catalina 22s are stiff, and if knocked down, right themselves quickly. The swing keel is the least ballasted of the boats and is the most tender. The fin keel is the most ballasted and most stable version. 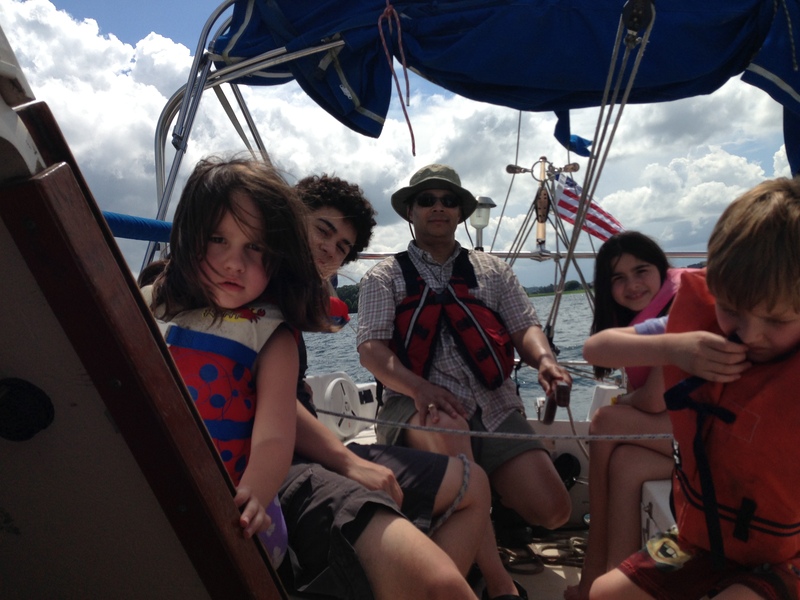 All three keel configurations sail well on any point of sail. 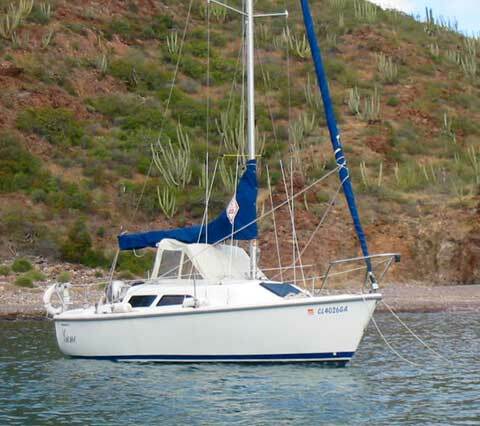 Catalina 22 owners consistently refer to the boat as “forgiving”. 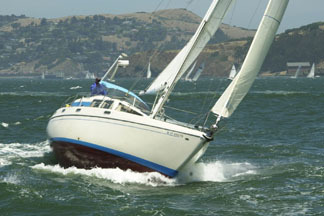 The swing keel performs the best to windward due to its deep and high-aspect orientation when lowered. Due to its extremely low-aspect when raised, the swing keel can also perform the best running with the wind. The fin keel performs better on all points of sail than the wing keel. The Catalina 22 easily achieves hull speed in light-medium airs. Many Catalina 22 owners report preferring to reef when winds reach above 10 knots, while others report never reefing even with much higher wind speeds. The boat has a tendency to round up into the wind when over canvassed, which can count as a safety feature. 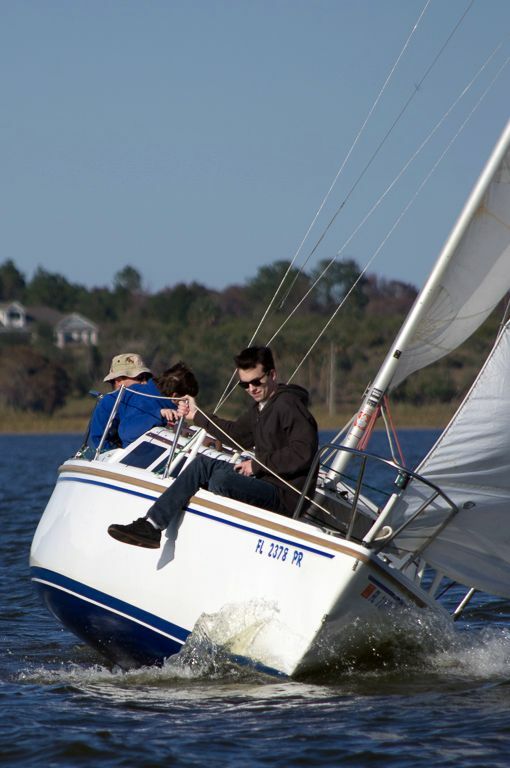 Unlike smaller day sailers, the cockpit of the Catalina 22 provides a very secure and dry ride. The cockpit is large (larger than its bigger sister, the Catalina 25) with a moderately deep sole and wide benches. 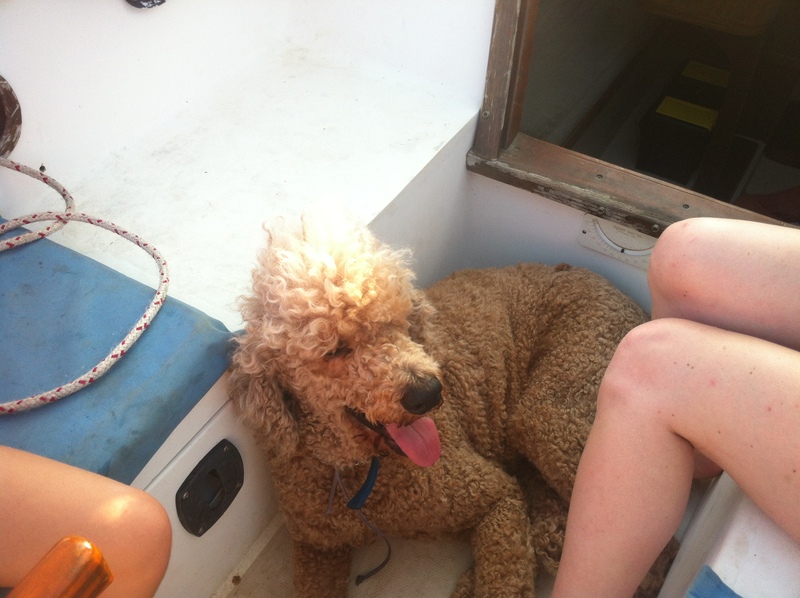 Leaning against the bulkhead at the forward end of the benches provides an excellent lounging position facing aft. The coamings are moderately high, which add to a sense of security when seated. The benches are long enough for sleeping when overnighting or weekending. On Mark I boats, the cockpit sole slopes forward so that scuppers are necessarily located at the forward end of the cockpit. On any boat with cockpit scuppers located in the sole, keeping the scuppers free from debris, especially when the boat is not being used, is a common maintenance concern. Clogged scuppers can lead to cockpit flooding in heavy precipitation, and eventually flooding below decks. 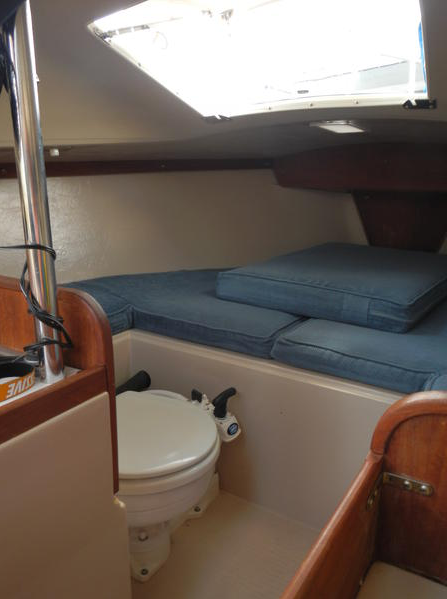 The scuppers drain through plumbing connected to a y-fitting and then a through-hull fitting beneath the companionway steps. 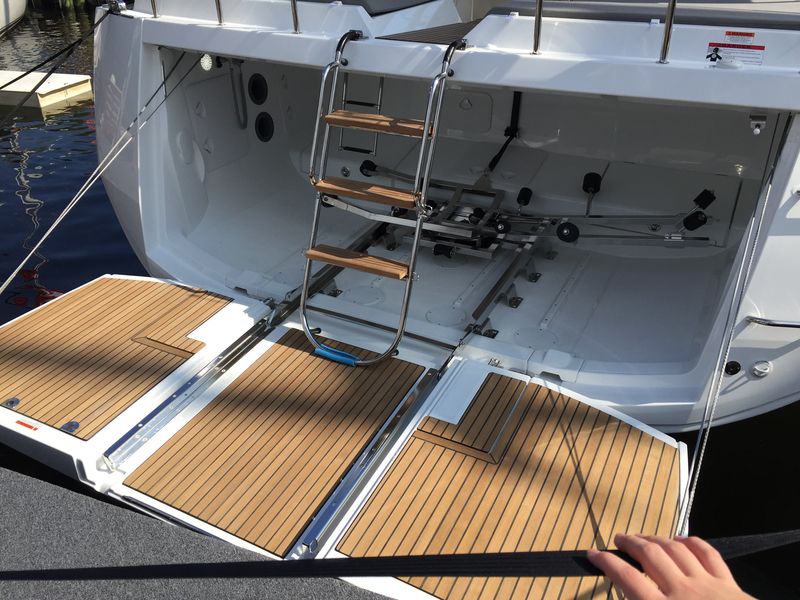 Catalina Direct offers a kit to install additional scuppers in the transom of the boat to aid the factory installed scuppers. With the New Design, Catalina began installing scuppers that drain through the transom. Beneath the port cockpit bench is a relatively large lazarette, accessible from a hatch at the aft end of the port bench. The lazarette is not big enough for sail storage but works well for storing lines, bumpers, and other equipment. On Mark I models, this lazarette also functions as a fuel locker, which is functional because the locker is not open to the interior of the boat or the bilge. The lazarette is vented to the outside by cowlings on the side deck. The sole of the lazarette slopes downward to forward so that fuel fumes can accumulate in the lazarette. Some Mark I owners report that fuel fumes can seep through the bulkhead at the forward end of the lazerette into the cabin. For the New Design, Catalina improved this design so that the fuel tank was separated from the lazarette and vented to the cockpit. Some Catalina 22s came equipped with a manual bilge pump mounted in the port lazarette, with the pump handle accessible from the cockpit. A boarding ladder hung from the transom on the starboard side was optional. While boarding ladders are an easy fit to most any boat, a Catalina 22 specific boarding ladder is available from Catalina Direct. Moving forward from the cockpit, the side decks are necessarily narrow. For a boat of this size, the side decks are excellent. Many boats of this size eliminate side decks all together, especially newer designs, requiring sailors to cross over the cabin house to access the foredeck, which is disastrous in appearance. 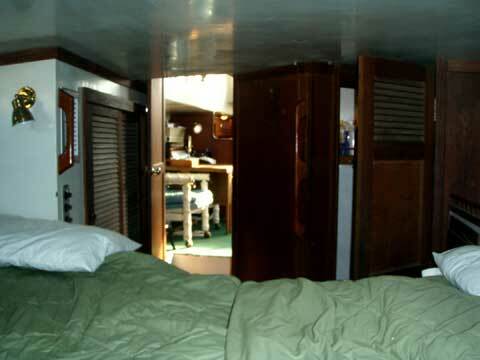 Butler maintained the boat’s good lines and proportions by keeping side decks, even if narrow. 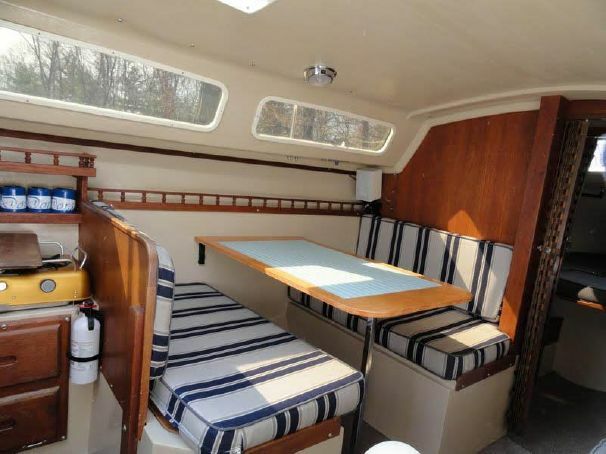 Some owners remove their lifelines, which generally looks attractive, and in this case makes moving along the side decks easier. Considering the limited effectiveness of the lifelines due to their low height, their removal may add to safety aboard on any Catalina 22 unless small children will be aboard. Due to the size of the boat, there is always some rigging to hold within arms’ reach. The foredeck is a good size for managing a foresail and includes a sufficiently secure bow pulpit. 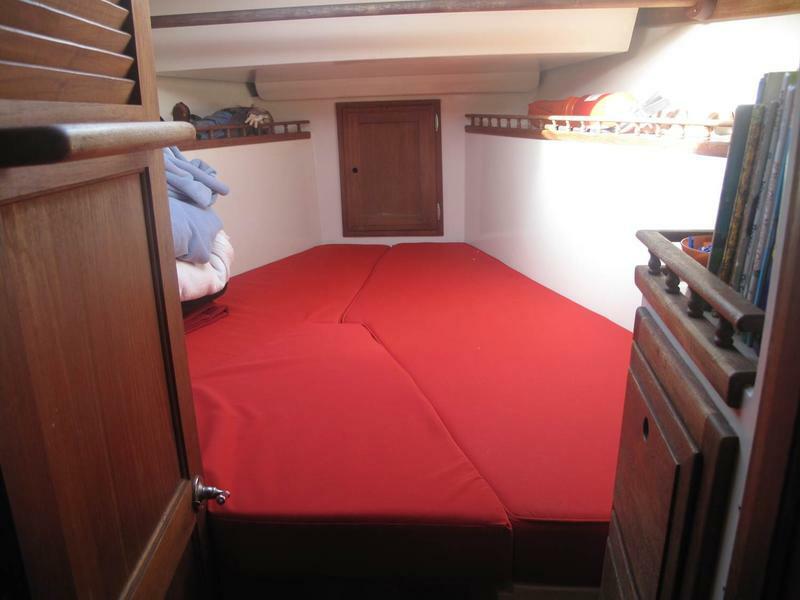 On Mark I boats, there is a large hatch in the center of the foredeck, which opens to the v-berth below. On New Design boats, this hatch was moved aft to the forward end of the cabin house, which improves the foredeck for sail handling. 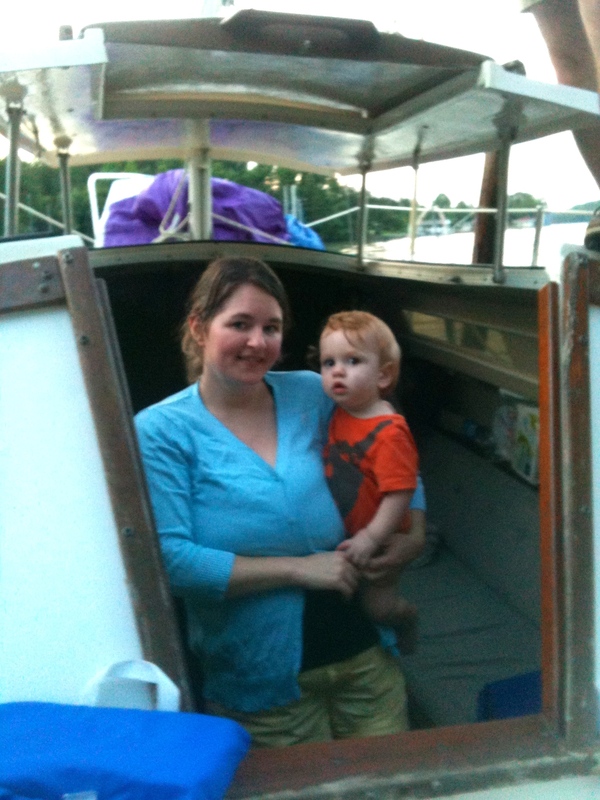 On Mark II boats, this hatch was changed from solid fiberglass to smoked plexiglass. 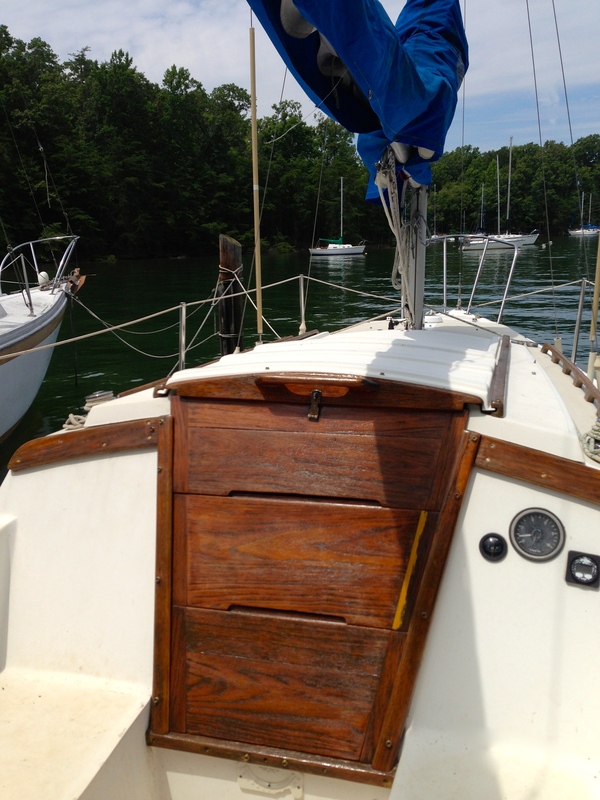 Due to the rising sheer line of the forward end of the deck, the plywood core in the foredeck is prone to rot if the watertightness of the foredeck fittings is not maintained. Many owners have addressed rotted cores with various techniques that involve removing the rotted core from below decks. Addressing this issue from below leaves no adverse blemishes on the foredeck. Mark I Catalina 22s have no anchor locker. Many Mark I boats are fitted with an anchor holder mounted on the bow pulpit. For any Catalina 22 not already outfitted with one, anchor holders are available from Catalina Direct. Catalina introduced an anchor locker with the New Design. The Catalina 22 has Catalina’s traditional wide companionway with three hatch boards. With the hatch boards removed, the interior of the boat is greatly opened. 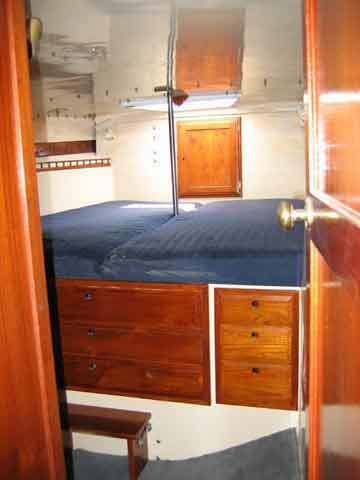 This companionway is an excellent place to stand while under sail from which all operations of the boat can be observed and guests in the cockpit tended with food and beverages. Headroom is limited at 4′ 4″, which owners report is great for their children. In 1973, Catalina began offering the pop-top as an option, which swings up on 4 stainless steel struts and increases headroom to 5′ 7″. Catalina modified the pop-top for the Mark II model, replacing the struts with a hinge at the forward edge, making it easier to raise. 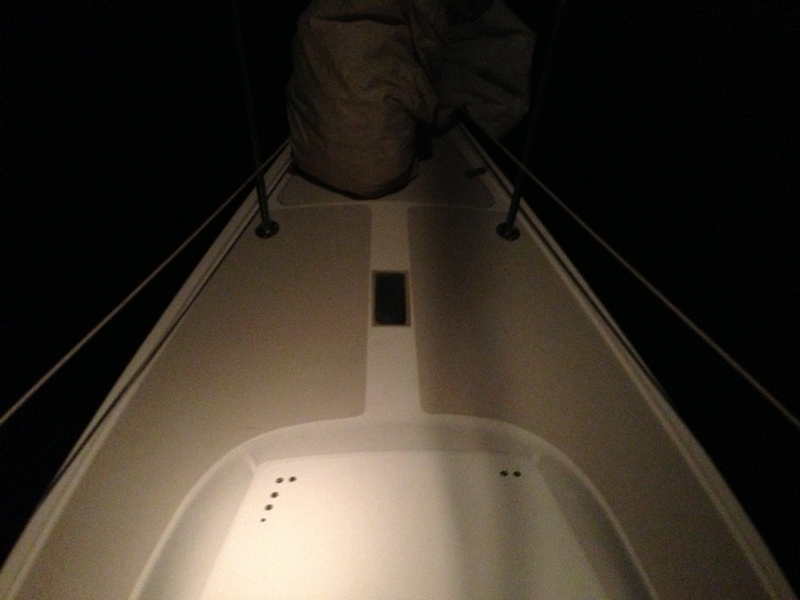 Below decks, there is a wide but short v-berth forward with a removable central insert at the aft end. On Mark I, New Design, and Mark II boats, beneath the central insert is a large storage area open to the salon. Many owners keep port-a-potties in this space and some install marine heads. Some Catalina 22s were delivered from the factory with marine heads installed in this space. 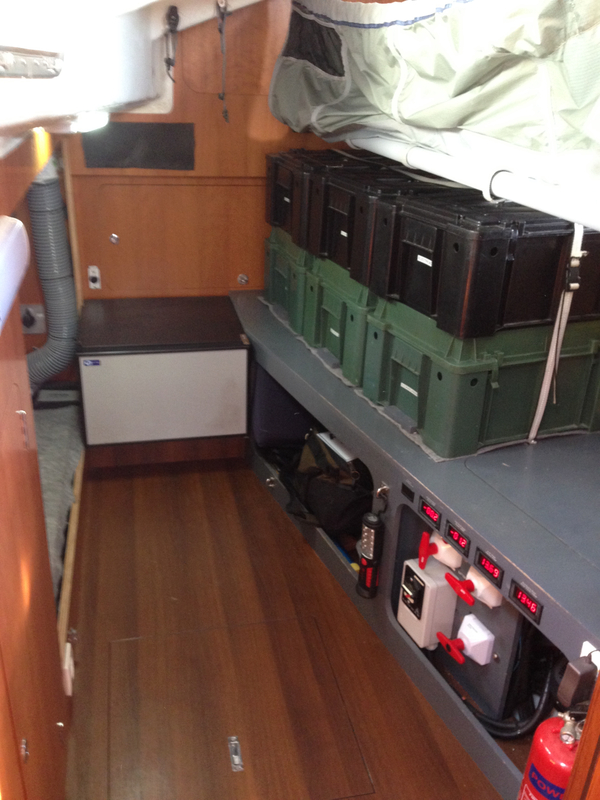 Also beneath the v-berth are two smaller storage areas. The aft end of the v-berth can be enclosed with the factory-installed curtains, which offers some privacy if used as a head area. On the New Design models, there is an icebox to port a centerline sink between the aft end of the v-berth and the forward dinette seat back. 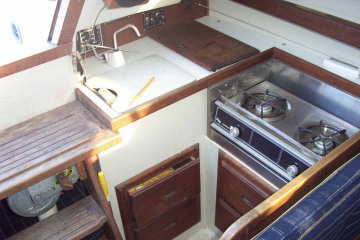 To starboard there is a two burner stove and a drawer beneath. Some owners remove this stove, leaving a deep shelf for storage. Aft to starboard is a settee long enough for sleeping. 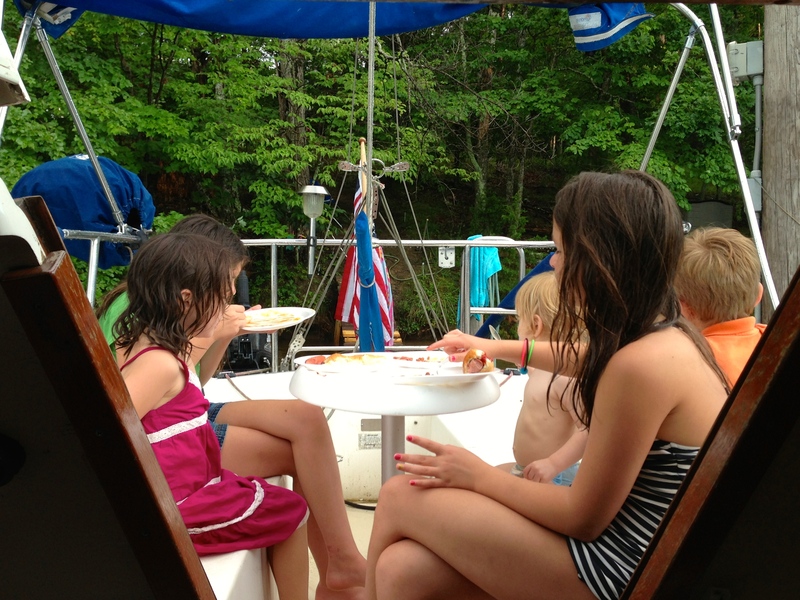 On the Mark I models, aft to port is the dinette, which can seat two adults and two children. 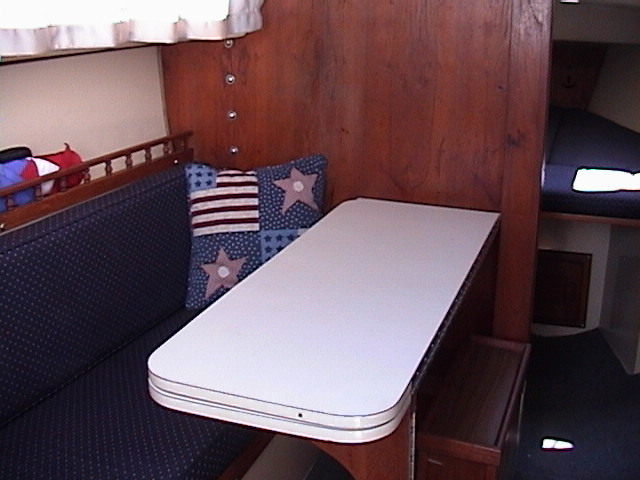 Outboard of the starboard settee, and the dinette to port, are shelves built into the hull. 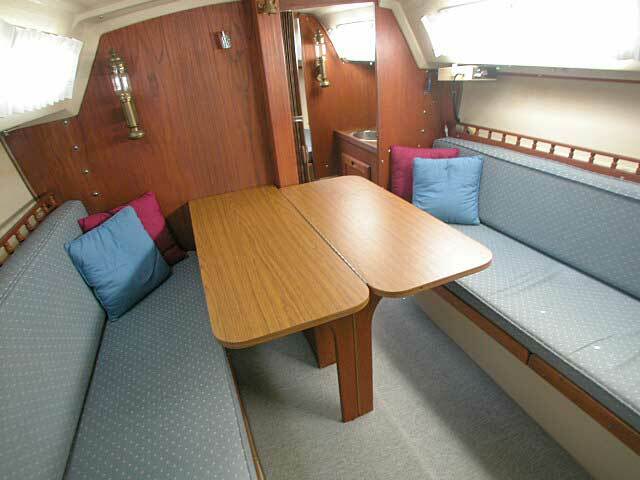 There is storage beneath the starboard settee, the dinette seats if on the Mark I model, and the port settee if on the Mark II model. On the Mark II model, the port settee continues aft beneath the cockpit, making the port settee long enough for sleeping. 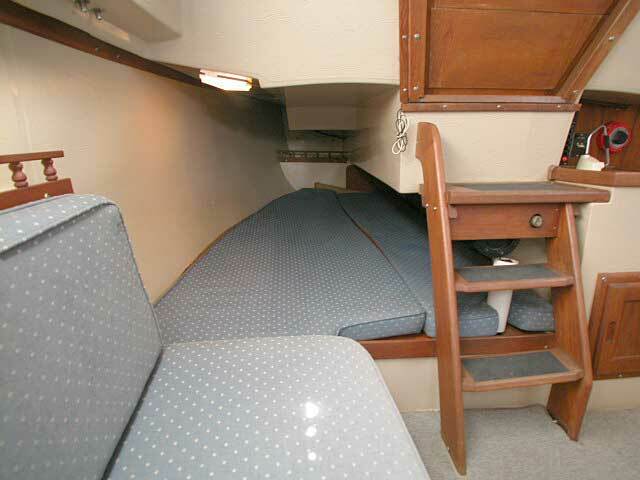 Aft of the starboard settee is the “Captain’s Quarter Berth”, which is uncomfortable as a berth due to low headroom. 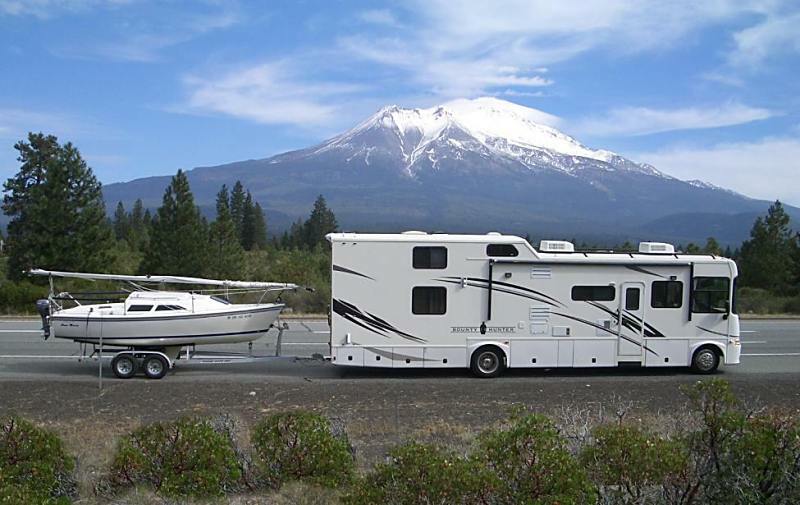 Most owners use this space for storing whisker poles, boat hooks, camp stoves, oars, and similar long and flat gear, or mounting radios and other equipment. 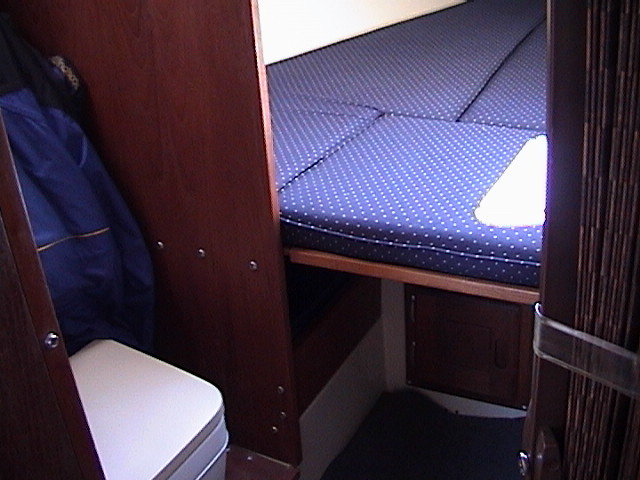 The aft most end of this quarter berth is accessible from a hatch in the cockpit. For Mark I and Mark II boats (but not the New Design boats), Catalina offered a galley that would slide out from under the quarter berth for use. 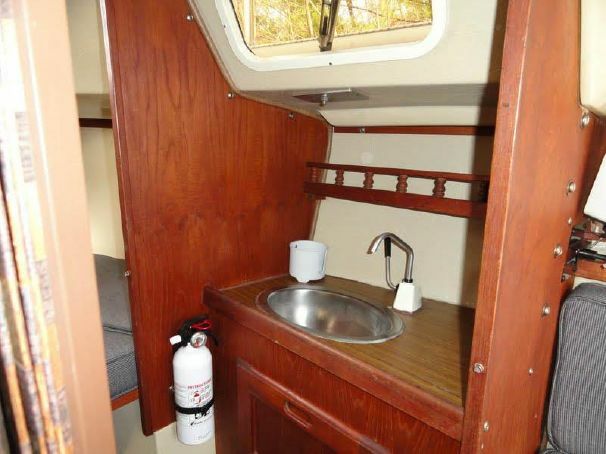 On Mark I models, the slide-out galley included a sink, two burner stove, icebox, and storage drawer. 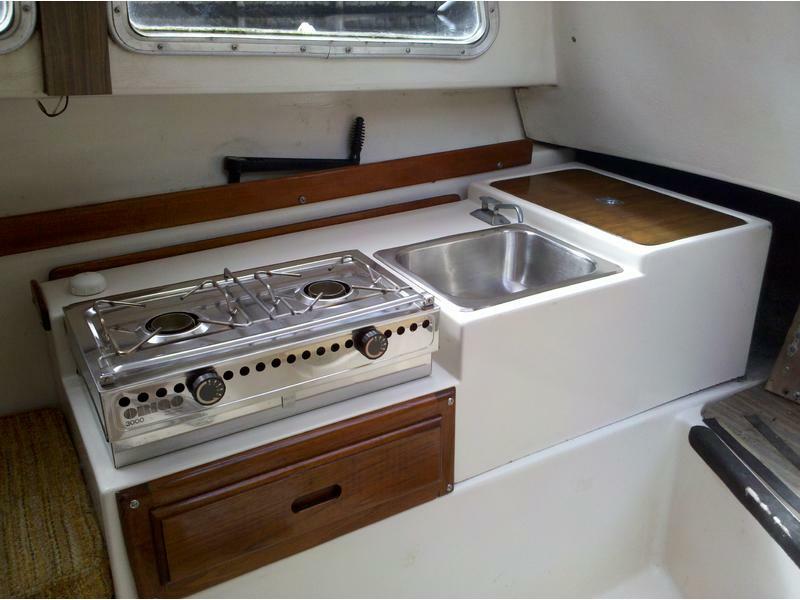 On Mark II models, the galley was smaller, and only included a sink and single burner stove. 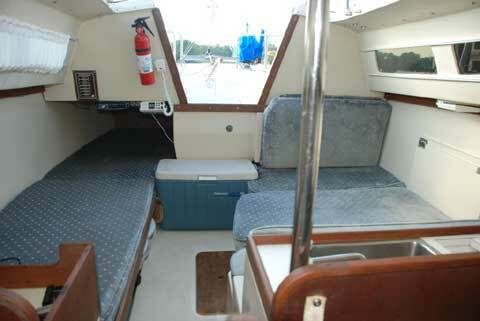 The icebox was moved to and became an integral part of the companionway steps. For the Mark II models, Catalina made the interior more spacious by widening the hull above the water line and widening the interior by 10″. The Catalina 22 has no opening port lights, but none are necessary. Ventilation on the Catalina 22 is excellent. The large forward hatch funnels air into the cabin when under sail. 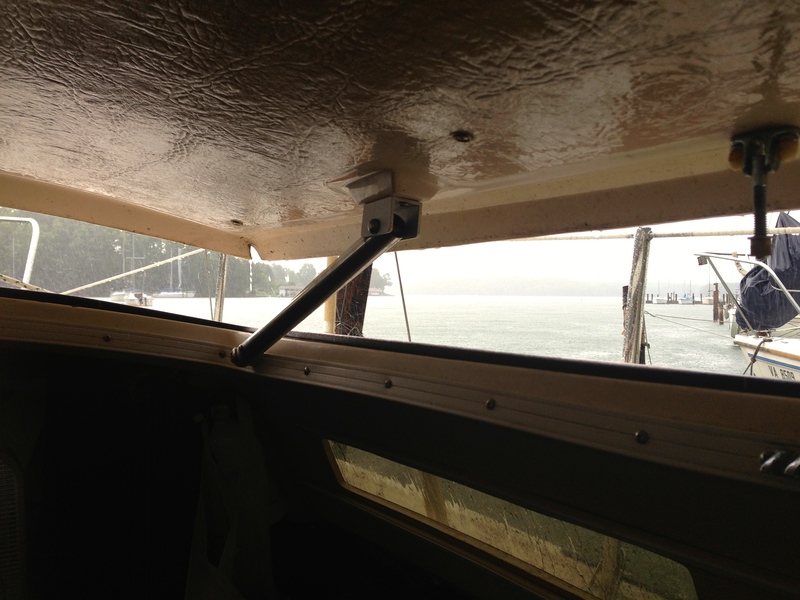 At the dock, owners report that a box fan can be placed in this hatch to effectively force air throughout the cabin. The pop-top opens the entire salon dramatically. 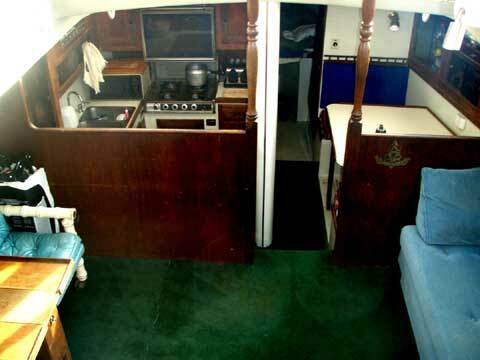 The large companionway contributes to this openness as well. The Catalina 22 is powered by an outboard motor hung on the port side of the transom on an adjustable mount. Long shaft motors are preferred. A 5 h.p. 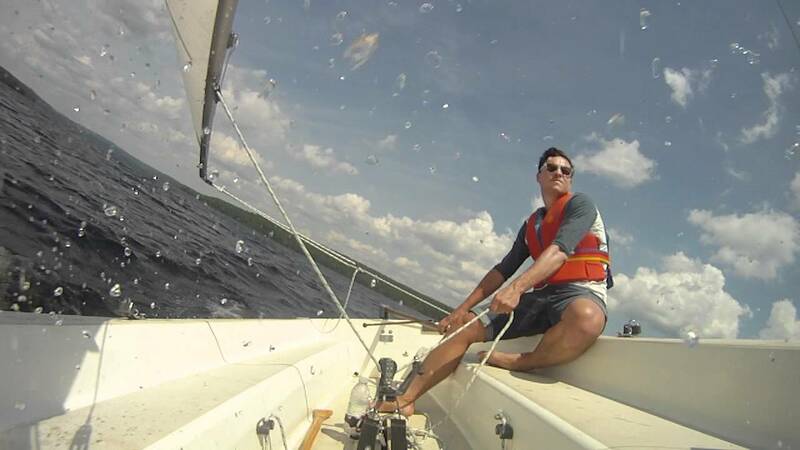 motor is more than adequate for pushing the boat even in rough conditions. Many owners report having Catalina 22s equipped with less powerful motors without issue. With a maximum displacement of 2490 lbs. 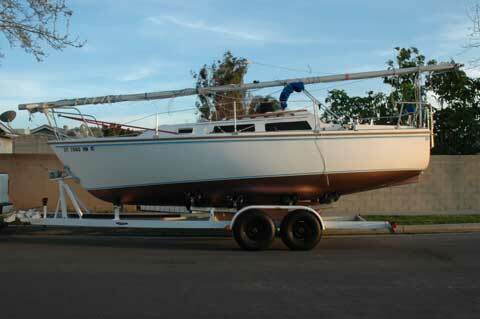 or less depending on keel model, the Catalina 22 is easily pulled without a powerful truck as a tow vehicle. The light weight also enables the Catalina 22 to use a single axle trailer, although the trailer wheels should be of the 5-lug type. The swing keel and relatively flat bottom also mean that many powerboat trailers can be easily modified to support the Catalina 22. 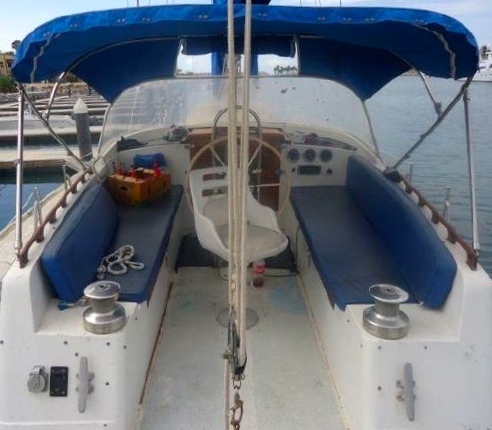 Catalina 22s can be found on the used boat market typically ranging anywhere in price from $2,000 to $22,000, mostly depending upon age and condition, installed equipment and upgrades, and whether or not a trailer is included in the sale. However, derelict project boats occasionally pop-up for much less. 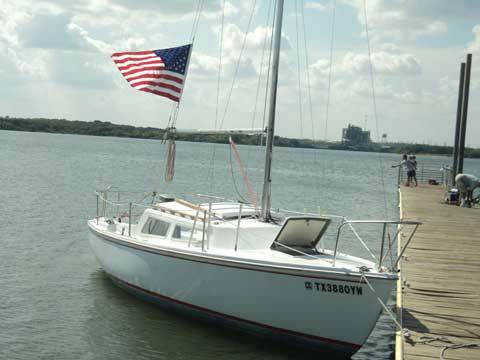 Due to the ubiquity of the Catalina 22, it is always easy to find one for sale on Craigslist, Sailboat Listings, Sailing Texas, and other venues, and there are a plethora on Yacht World. 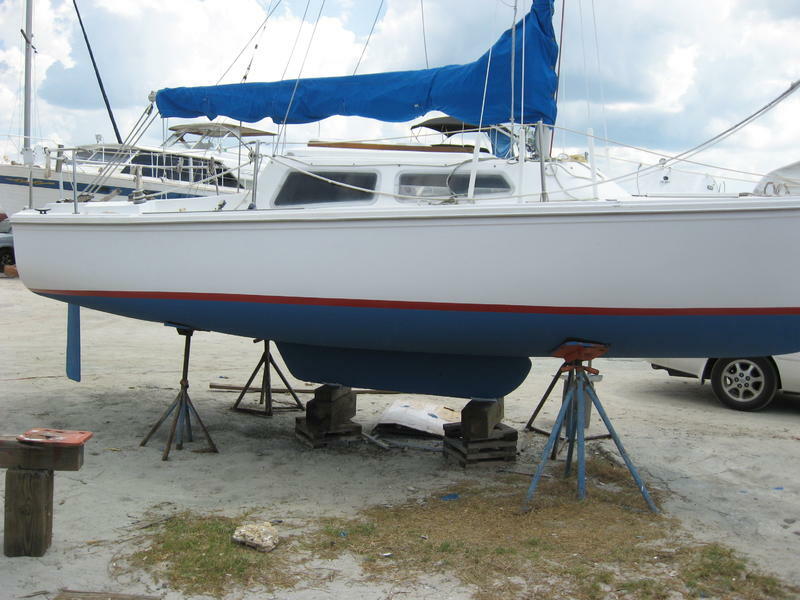 If shopping for a Catalina 22, make sure all swing keel maintenance has been performed or be prepared to do it. Check early boats with aluminum trimmed windows for leaks, which was common but easily repairable. Check for foredeck core rot, stringer rot, and hull blistering, which were hit and miss problems on earlier boats. Otherwise, there is nothing special to consider with these boats that you would not for any other boat. Special thanks to Jeremy Smith for his contributions to this article. 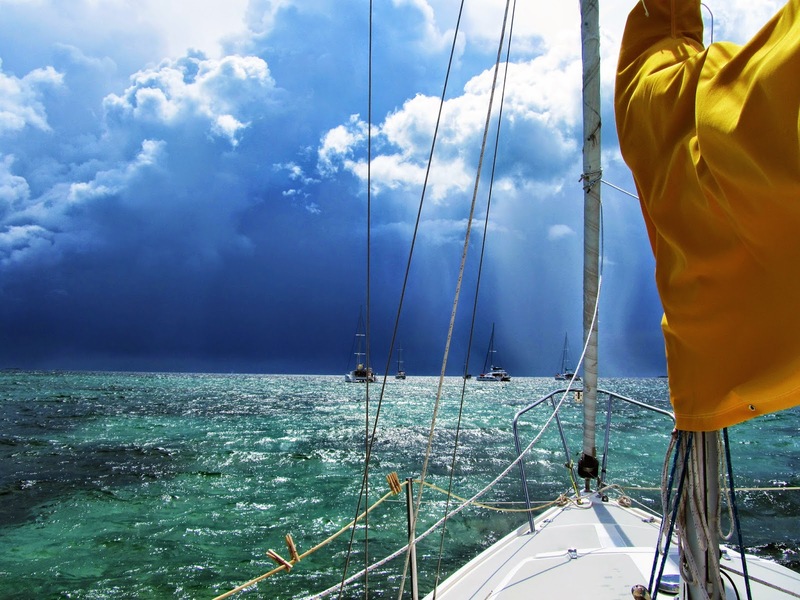 Ken Neumeyer penned a fantastic read titled Sailing the Farm. In it Neumeyer describes how a cruising sailor can make his boat a sailstead (like a homestead), whereby he can live on and by the sea for extended periods. This book is now out of print. The link below will let you download the book in its entirety.